Tax season is here! IRS has announced that the tax-filing will begin on January 29, 2018, and the filing deadline to submit 2017 tax returns is April 17, 2018. Even though tax season 2018 seems late and accountants, CPAs, and tax preparer have extra time to prepare in advance, it’s actually a shorter tax season of 79 days, in comparison to tax season 2017 which last 86 days. So, in this season, you are required to file MORE in LESS time. At Ace Cloud Hosting, we always help you prepare tax returns and accounting easily with our superfast and secure cloud hosting along with helpful resources and content. With the previous posts of Blog Series “Tax Season 2018”, we shared tips and suggestion on how you can prepare for tax filing season, what documents you need, what you should keep in mind for your data and privacy security, what mistakes you should avoid, and how cloud technology can help you prepare your taxes much faster and safer in this tax season 2018. 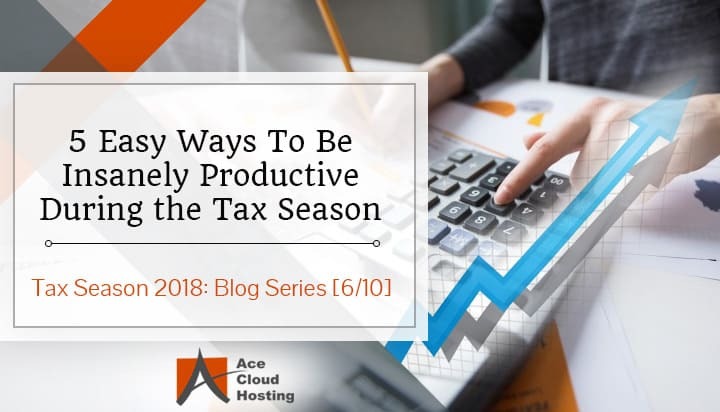 Continuing in the series, in this post, we‘ll discuss how can you get most of your time for becoming more productive and file more taxes in this busy and stressful tax season 2018. There are only two ways to get output on something, either you put in more hours or you work smarter. What would you choose? Tax season can be stressful if you are not managing your time properly. According to a Zogby Interactive Survey, about 56% of Americans say tax-filing is “stressful”, while 18% consider it “very stressful”. And this is a fact the stress reduces your performance and satisfaction at work. Planning in advance can help you do more, faster and with less. Here’s how. ➟ You may think you have enough time for various tasks but unexpected interruptions and multitasking can eat more time than what you expect it to; making you unorganized and stressed to cause delays with deadlines. Tracking and defining how much time you spend on different tasks and planning your day in advance can significantly improve the productivity. Tools such as RescueTime can help in understanding how much time you daily spend on your habits and daily tasks such as social media, emails, entertainments and other apps. ➟ We, also, spend our lot of time doing multitasking – be it working on a presentation, writing an email, reading news, talking to colleagues at the same time. But, In reality, working on more than one thing at a time reduces your focus and performance at work. By switching from multi-tasking to single-tasking you might even increase your (and your team’s) productivity by 40%. ➟ It’s always better to handle lengthy and tougher tasks when you are most alert, this could be morning time or the time after a break. There are a ton of tools such as Evernote that can help you plan your day in advance by organizing and prioritizing things to do. ➟ If you are a CPA firm, mapping your process, identifying and documenting every step involved can help you better organize your work and boost overall firms productivity. Web-based workflow management tools such as Trello can help you set up and monitor the tasks by keeping all staff and clients on the same place. Tax season is the best time to upgrade your technology, which enables employees to accomplish more in less time. It also ensures that you would not face any difficulty or disruption while using your IT assets during tax-filing work. Productivity can be increased only if you are using the right technology from automatic bill pay to prepare and file taxes for your clients. ➟ Make sure you are running the latest operating system and up-to-date desktop software such as MS Office, QuickBooks, Lacerte, Chrome, etc. This is also a good time to replace your old and faulty computer hardware such as keyboard and printer. Because a slow computer will make you and your staff wait. ➟ Make sure that you have a high-speed and reliable internet connection 24×7. A high-speed connection will make you access and transfer files, cloud-accounting software, and web-based software faster and easier. Plus, it would be easier to communicate and collaborate with your employees, especially remote employees without any delay or disruption. 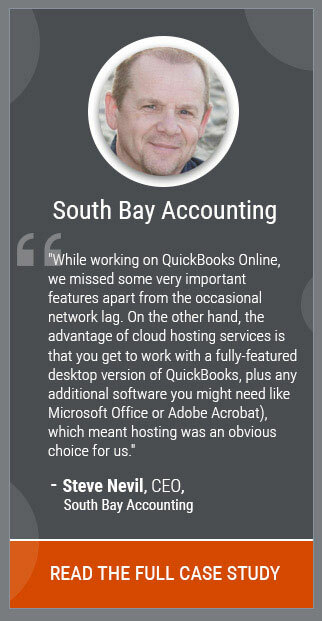 ➟ Using a cloud accounting software or hosting your tax software or desktop accounting application such as QuickBooks on the cloud will enable you access and work anywhere and anytime on your accounting data with enhanced security. Plus, it facilitates a better collaboration with your clients because they can see the changes and work done in real-time without the need for sending files back and forth over email. ➟ Another technology that you must have for your accounting firm in this tax season is the unified communication or VoIP. While there are many communication methods such as emails or phone, however, clients may prefer other channels such as video calls. VoIP technology facilitates video calls, voice calls, efax, virtual PBX, and other cloud communication services that enable a fast and effective communication with clients. Most of us are aware that taking breaks help you refresh your mood, better focus on work and keep your energy level high. Research shows that those who have a brief diversion from a task perform better than those who just keep at it without a break. ➟ In your daily calendar, identify the opportunities for a break at work. ➟ Follow Rule of 52 and 17 in which you work for 52 minutes at a time, then take a break of 17 minutes before getting back to work. ➟ Organize your desk and keep everything in the right place because the messiness will slow you down finding tax-related paper, files or other important office stuff. ➟ During the break, grab a coffee, take a walk, eat something healthy, listen to music or do some exercise. If you are a CPA or accounting firm, make sure you have sufficient breaks for your employees in your working policy so that they are always productive with their action and behavior. There is a clear link between employee appreciation and its impact on his engagement with your business and productivity at work. According to Globoforce, 78% of employees would work harder if their efforts were better recognized and appreciated. ➟ Set up an employee reward and recognition policy in your accounting firm to neutralize a positive company culture, inspiring workplace and make the employee feel valued and appreciated. How much time do they spend on a particular task or client’s work? How much help do they need to get the work done? What kind of and how much business they are bringing in? Do they have the responsibility to help others? ➟ Always reward the right thing that aligns with your firm’s mission and encourages hard work and team collaboration. Praise for their good work, add new responsibilities, add some people such as Interns or new staff to teach and manage them, offer benefit packages or goodies are some of the things you can do to motivate them and recognize their efforts in this tax season. Admittedly, we are all constantly busy with our smartphone’s notifications – be it social media update, new like or comment on Facebook, email alerts, or office chats, which distract you doing a particular task. For example, it almost seems difficult to write an email without being interrupted by a Facebook notification or a WhatsApp message. According to a research by Deloitte found that on an average, people look at their phones 47 times a day, which shows how your smartphone can break your attention. So, how are you supposed to focus on this busy tax season with all notification calling for your attention? Here is how. ➟ Set two or three time-blocks in a day when you will check your social media notifications and activity. ➟ Similarly, check and respond to emails at a certain time or time-block you’ve assigned for emails, not all day along. ➟ Break time is a perfect time to call your friends, family and loved ones. ➟ To set time blocks where you can turn off notification, tools such as Offtime and Flipd can help you. Offtime even can categorize notification as ‘work’ or ‘family’ related. Distractions are part of life. You can’t avoid them completely but can manage your time effectively so that they don’t fill up your whole time and reduce your performance at work. The more you’ll focus on one task at a time, the more you’ll be productive and focused. Head on over to these above-mentioned hacks – not only your productivity will get a boost but will you feel better overall as well. So how are you planning to manage your time in this tax season? Is there something you would like to add this list? Please share in comments below. In the next post of this blog series, we’ll back with the tips and advice that you should follow to avoid identity theft. Follow Ace Cloud Hosting on Twitter, Facebook, or LinkedIn and subscribe to the email newsletter to receive updates when the article goes live. Prepare, Tax Season 2019 is Near! Why Your Accounting Firm Should Care About Cloud This Tax Season? 5 Tips to Have A Smooth Tax Season How Can Tax Professionals Be More Agile This Tax Season? According to me, delegating or hiring a temporary resource or intern can also help a lot. Parting the workload can spare more time for the accounting professional to bring better ideas for getting tax benefits. Terrific read! Rewarding is a great way to encourage employers to do work more efficiently. Agreeing with you. Systematic planning fasters the process. Healthy work-life balance can be achieved by planning and scheduling early keeping your capability in mind. Embracing technologies like automation provide a great helping hand, especially during tax season. Although it can not replace the guidance and skills of a professional but definitely can improve taxation.